As you've seen over the past couple years, at Microsoft we’ve been rapidly releasing container innovation to the Windows and Linux ecosystems – partnering with industry leaders like Docker and Mesosphere to deliver container solutions that help companies build and deploy applications at cloud speed and scale, whatever their choice of platform or tools. Last year, we introduced Hyper-V Containers, a first-of-its-kind innovation designed to deliver the high-density experience of containers with the isolation of traditional VMs, when you want an extra boundary around the code being run – to support a wider range of customer/industry needs. We also partnered with Docker to bring together the Docker and Windows ecosystems with Windows Server Containers – making containers available to the broadest set of developers for the first time. We’ve been partnering with them continuously ever since to extend this promise to the Linux and Windows ecosystems, including demoing the first ever multi-platform container application that will combine Windows Server containers and Linux containers. Within Microsoft, our overall adoption of open source continues to rapidly grow. In just a year's time we've gone from one in four of our Azure virtual machines running Linux, to nearly one in three. We’ve also built Docker support into tools and extensions like the cross-platform Visual Studio Code editor, enhancing the Docker experience for every developer. As the cloud for enterprise, Microsoft Azure has seen a huge uptick in just the past few months as enterprises begin to adopt container technology – moving from "hypothesis" to "reality" as they realize the benefits of cost savings and business agility containers can provide. According to a recent survey on the future of Open Source Software by North Bridge Partners, seventy-six percent of 1400 companies surveyed globally plan to use containers in 2016 and forty percent already were. Looking at our own customer data, we've seen a quadrupling of container customers, accompanied by a doubling of container consumption in just the first months of 2016 alone. Of that data, more than twenty-five percent are Fortune 500 enterprises across some of the most traditional enterprise sectors where mission-critical applications are commonplace – such as financial services, retail and manufacturing. Open Source: According to Forrester, over forty percent of CIOs view adoption of open source technologies as critical for them in the next year – primarily because of low cost, avoidance of vendor lock-in and agility. And that same North Bridge study saw use of OSS increased sixty-five percent over same companies surveyed from previous year. Choice: We’re always hearing from our customers that choice and flexibility matter. They don’t want to switch away from the tools, technologies and platforms they're already using, they want to leverage their existing investments and skills in a cloud that meets them where they already are. Hybrid: Enterprises still have multi-million dollar investments in their on-premises infrastructure and, while seeing the benefits of the cloud, often have business reasons for keeping some elements of their applications on that infrastructure. A hybrid cloud solution that can manage container-based applications across on-premises and cloud infrastructure is a compelling proposition. Docker Datacenter is now available in the Azure Marketplace, bringing container management and deployment services to enterprises with a production-ready platform supported by Docker and hosted locally behind the firewall. Deployment from the Azure Marketplace using pre-defined ARM (Azure Resource Manager) templates simplifies and reduces the time to stand up Docker Datacenter and get productive. Docker Datacenter managing a hybrid, container-based application spread across Azure and, for the first time, Azure Stack on-premises. Azure Stack is Microsoft’s unique offering, providing “Azure in your datacenter” through consistency and connectivity. We’ll show how Docker Datacenter operates across public and private Azure clouds in true hybrid mode, enabling customers to manage hybrid applications with components in Azure and on-premises with Azure Stack. 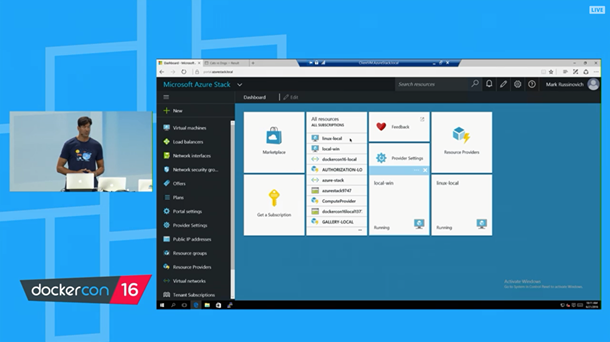 Operations Management Suite (OMS) managing containers across Microsoft Azure and Azure Stack on-premises. Operations Management Suite (OMS) is Microsoft's cloud IT management solution for any hybrid cloud, including Azure, AWS, WS or Linux, VMWare or OpenStack. Preview of Azure Container Service adding support for Windows Server containers, using Docker Swarm to provide native clustering capabilities to turn Docker hosts into a single, virtual host. Azure Container Service is built on a choice of open source orchestrator technologies including Docker Swarm, to simplify configuration and deployment via few-click templates. With this, Azure Container Service now supports Linux and Windows Server, which will make the service available to developers regardless of their target operating system. SQL Server running on Linux, in a Docker container. As we announced back in March, SQL Server on Linux is available as a private preview now. As of today, private preview participants can get SQL Server on Linux on Ubuntu – as a Docker image. As enterprises use containers for production workloads, industry standard workloads like SQL Server will also need to run in containers for maximum portability and agility. This is noteworthy as containers continue to proliferate – particularly given SQL Server's mission critical performance, industry leading TCO and hybrid cloud innovations like Stretch Database to access data on-premises or in the cloud. Enterprises are increasingly adopting containers. As they use them for increasingly complex scenarios and manage them at scale, Microsoft is in a unique position to help them with our deep hybrid cloud capabilities, our flexibility and commitment to openness. Our container strategy and our Azure strategy are both differentiated by deep commitment to open source technology, providing customers with the broadest range of choice to match their preferences and investments. As we continue to grow our partnerships with other industry leaders like Docker, our guiding principle is delivering maximum choice to our customers so they can access market-leading innovation – and ultimately use that innovation evolve their businesses at cloud speed and scale. If you missed the livestream, you’ll be able to catch the recording of my keynote and other sessions on the DockerCon website.